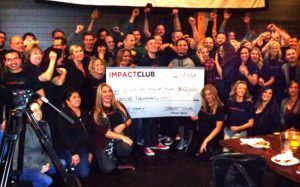 The Temecula Impact Club then hears presentations from community groups and chooses one winner to benefit from the generosity. Come on, it’s about a dollar a day. Not even what you spend at a coffee shop. But when you bring about 120 people together, each of whom have saved up $100 over a three-month period, that daily loose change can have a huge effect. Our local Temecula Impact Club meets every three months to hear presentations from three local charities. Then club members pool their resources together to make one giant check. At a recent meeting, the amount was $12,500. Many sported black Impact Club shirts when they gathered at a local brewery. Spirit abounded and it wasn’t just because of the alcohol. These people were there to make a difference. Josh Painter leads the group that’s starting its third year and has donated about $150,000 in that time to nine local charities. Painter, a local Realtor, said many charities struggle, in part because people don’t know who they are. The Impact Club and the donations help the charities do their work and spread the word about their endeavors so they can do even more good deeds. The concept is known as impact venture capitalism. Representatives from three charities were gathered at the brewery: Temecula Valley Veterans of Foreign Wars, Rancho Damacitas Children & Family Services and Operation Silver Star. Their task was to tell their story in five minutes. The VFW’s John Hernandez was up first. One goal of his group is to help those who serve in the military, get out and then have to deal with challenges in civilian life. For some veterans it’s no problem; for others it’s difficult. Cal Winslow of Rancho Damacitas said his group is working to break a cycle in which so many kids that start out in foster care end up in jail. The group has created what he called an “empowerment village” where people are taught the value of family, friends, fitness and finances. Their success stories keep the charity’s workers motivated. “This is the greatest reward we could ever give,” he said. Delia De La Cruz said her group was started to honor her three sons who are combat veterans and suffer from post-traumatic stress disorder, including Jesse, who also is an amputee. Her family stopped everything to be by his side while he recovered. They realized how many wounded veterans and families faced the same hardships, which inspired them to start Operation Silver Star to help these people. Three great stories. How do you say no to any? A tough vote indeed. The Impact members know the drill because, within a few minutes, they turned in their ballots and Painter and his helpers tabulated the results. A giant check – both in size and money – was issued to … drum roll, please … De La Cruz and Operation Silver Star. She fought back tears as she thanked the group for its contribution and how much help her group will be able to provide for loved ones of our wounded warriors. Everybody cheered and gathered around De La Cruz and the check for a giant group photo. The crowd was smiling, a happy ending if there ever was one. Who says pocket change can’t make a difference?